North End Island Paradise! Our Beach House 'Sunny Daze'! Our Beach Home, Sunny Daze, is newly remodeled and is located beachside on the north end of Beautiful Fort Myers Beach. The beautiful beaches are only 50 steps away! Within walking distance of the pier, shops, restaurants, Time Square, and more! White sand beaches and beautiful Sunsets await you! Come, relax in Paradise! Visit our website for more information! Complete with all you need! Furnished kitchen, Entertainment Center, Private Tiki bar, Spacious Rooms, White Sand Beach and more...Paradise Found! Having arrived on the beach in 1990, we fell in love with the beach and have been coming back for over 20 years to enjoy with our family and friends. We have enjoyed raising our daughters on the beautiful white sands, as our island getaways from our MN home are something we look forward to many times throughout the year. Sunny Daze is truly a 'Paradise Getaway' for our family and all who stay! After looking at many properties on the island, we knew we the north end of the beach was where we wanted to be because of its ease of access from the main land, less peak season traffic and is the perfect location offering stress free beach escapes, beautiful sunsets, awesome white sands and the feel of true island life...Finding Sunny Daze was the perfect answer to our island dreams! Location, location, location...a short beach walk to the activity of Time Square with it's exciting shops, great dining and incredible life, yet just far enough away from the beach crowds and traffic to offer that true escape to Paradise! We are constantly updating the Sunny Daze to assure all of our guests the beauty and security of our beautiful beach house will be waiting for them when they arrive. Only 50 Steps to the Beach from the beautiful beach with white sands at your doorstep! 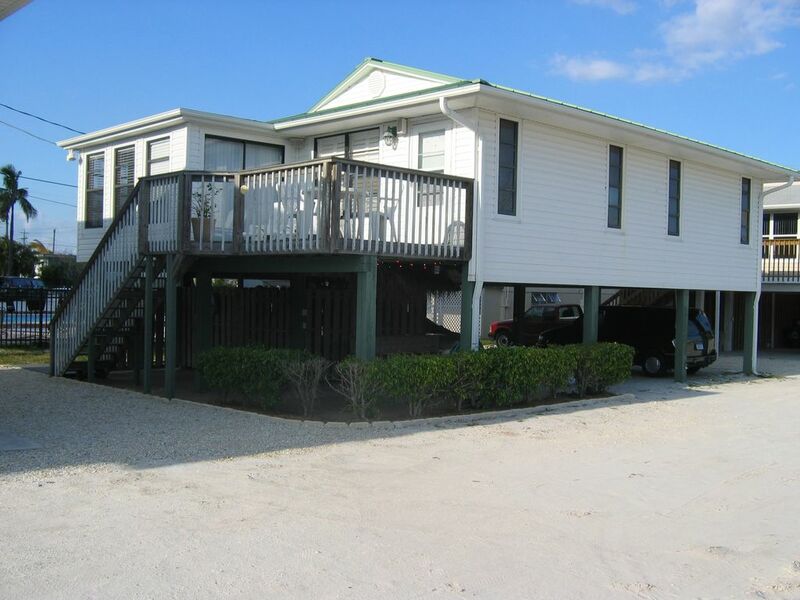 Located beach side, set back from the main beach just 50 steps away! Covered Parking, Free Long Distance, Tiki Bar, Beach Towels, Beach Chairs, Beach toys & More! Minimum Age Limit for Renters: Minimum age requirement of 30 years of age. Enjoyed our two week stay at Sunny Daze. It has cute beach decor and a fun tiki bar under the cottage. There’s plenty of room with two bedrooms and two bathrooms. We enjoyed being able to watch the sunset from the sunroom. Wish it was ocean front, but being third cottage back it’s only 50’ to the beach. We had trouble opening the lock box upon arrival but a quick call to Dave, the owner, had us inside in minutes. Dave is very responsive to any questions. We look forward to hopefully welcoming you again back to the island, and we thank you for staying with us! Awesome vacation at Sunny Daze! 9/15 - 9/22/18 Really enjoyed staying in your cottage! We had everything we needed plus more. Spent most of the week at the tiki bar! Everything was as described and very comfortable. Had a couple of days with Red Tide breathing issues, but overall the beach was wonderful! Plenty of nearby bars & restaurants to enjoy. Loved Doc Ford's and breakfast at Bonita Bill's. Took the Key West Ferry - made for a very long day, but glad we tried it. We would definitely stay here again if we visit the area. We almost had a crisis when the coffee pot wouldn't come on the first morning. lol. However, it was just a thrown breaker. No issues or problems at all. Thanks Dave!! So glad you enjoyed Sunny Daze! Your choices for food are great ones, as there are so many to choose from on the island as you stated. Also happy you were able to have a warm cup of coffee for your morning beach stroll, and we look forward to your return to the beach in the future! We spent a fantastic time at the Sunny Daze. Property is perfect, not missing anything you need for beach vacation, location with direct beach access perfect for little kids, overall it couldn't have been a better vacation. Thanks to Dave for being always available for any kind of questions. So glad you enjoyed your time at Sunny Daze, and we look forward to your return in the future! We love our stay at this house, however we unfortunately came at the wrong time due to the red tide. We couldn't enjoy the ocean because of it. That is the main reason we go to Fort Myers to enjoy their beautiful beach. I want a do over when the red tide is gone. :) The house is beautiful and equipped with everything you need. We are so glad you enjoyed our beautiful beach house... We just wish the red tide would have gone away to make your trip all that you had hoped for! We hope to have you back to Sunny Daze soon so you can enjoy the beautiful beach as we know it! Thank you again for staying with us! Dave has a great place Ocean view, his house is immaculate, Great furnishings, great entertainment, tiki bar. Steps to the 🏖�. We will stay here again, this is our 2nd stay here. I’ll rent from Sunny Daze on Fort Myers Beach again and again. It feels like home here. Thanks for sharing your home with us Dave. AGAIN VERY NICE AND CONFORTABLE, A FEW FEET FROM THE OCEAN. So glad you enjoyed Sunny Daze! Things are finally looking a bit better for our beautiful beach and ocean area as well. Thank you again, and we look forward to having you return in the future! Fantastic North End Island Paradise! Just steps to the beach, and minutes to all Fort Myers Beach is about! From great Sunsets, White Sand Beaches, Resturants, Beach Bars, Shelling, Relaxing and more, Sunny Daze provides you with all you need to escape to Paradise! Other Activities: Deep Sea Fishing, Shopping, Kayaking, Boating, Parasailing, Shelling, Wildlife Viewing, Golf, Miniature golf, Shuffleboard, wave runners, biking, walking, spending quality time! Golf: With so many Golf Courses to choose from, why look any place else?? Sunny Daze has all you need from Beach to Golf to FUN! Rates are subject to change. We prefer Saturday to Saturday rentals, but other date requests are welcome and usually met.